A passer-by noticed an old lady sitting on her front doorstep. He stopped and said to her, "Sorry, but I couldn't help noticing how happy you look! What is your secret for such a long and happy life?" 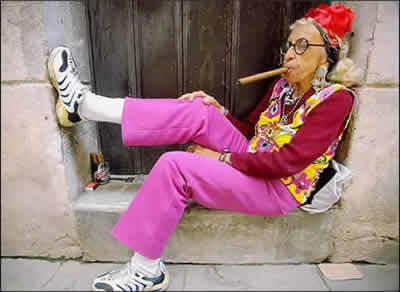 "Well, I smoke 3 packs of cigars a day," she said, "And before I go to bed, I smoke a nice big joint." She continued, "Apart from that, I drink a whole bottle of Jack Daniels each day and eat only junk food. On weekends, I pop a huge amount of pills, and I never exercise at all." "That's absolutely amazing," said the passer-by!